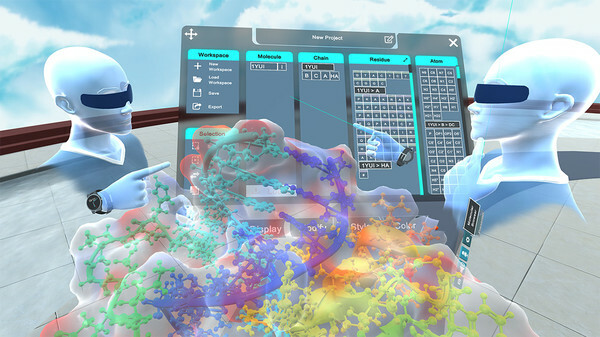 We are developing new, cutting-edge methods for the visualization and analysis of molecules and cells using virtual reality (VR) technology for analyzing important experimental data. These novel methods will have significant impact in our understanding of important aspects of structural biology, including drug design, the functioning of complex molecular machinery, and basic cellular properties such as motility. We aim to bring VR into routine use in labs at UCSF, with suitable analysis problems in cryoEM and light microscopy, and to advance VR capabilities for analyzing ligand-receptor interactions. This work will pioneer the way so that other research labs at UCSF can more easily adopt this technology. 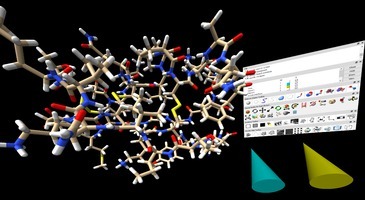 February 26, 2019: ChimeraX VR video tutorials for medical imaging (details), molecular models, cryoEM maps, and a look at opiod drug binding. February 20, 2019: David Drubin and Georjana Barnes lab at UC Berkeley trying VR for lightsheet microscopy. 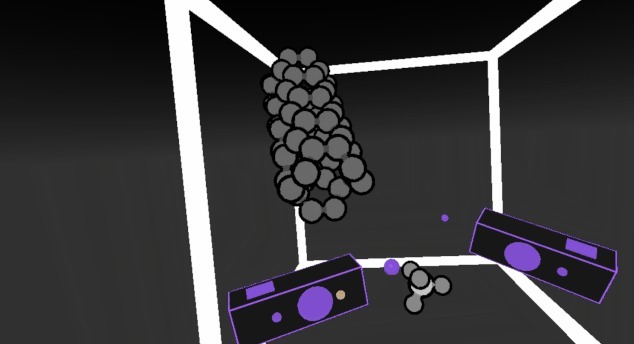 February 19, 2019: Cell Toss VR app by Blair Lyon at the Allen Institute for Cell Science shows 3d optical microscopy of cells in different stages of mitosis. January 10, 2019: Yifan Cheng lab at UCSF setup MacBook Pro / Vive Pro system for high resolution cryoEM maps. January 9, 2019: Dr Kurtis Auguste at UCSF Benioff Children's hospital shows patients VR tour of their brain before surgery to reduce anxieties. December 17, 2018: Matt Jacobson lab at UCSF setup iMac / Vive Pro system for studying drug binding. November 29, 2018: Loic Royer trying Vive Pro on microscopy data at CZ BioHub. November 20, 2018: Tests of VR on Windows laptops use with ChimeraX. November 15, 2018: How to setup VR on Mac laptops with an external GPU for use with ChimeraX. November 7-9, 2018: VR and AR science visualization hackathon in San Francisco hosted by Springer Nature. Sign up. October 26, 2018: How to setup VR on Linux for use with ChimeraX. October 23, 2018: Making Space: Molecules & Biomedical Imaging in Virtual Reality Open Swim a workshop to explore medical imaging data in VR at NC State University given by Meghan McCarthy and Phil Cruz. October 10, 2018: Opioids bound to mu opioid receptor ChimeraX VR demo. August 29, 2018: Nanome molecular VR for proteins and ligands. Extensive VR user interfaces. Free and commercial versions. Start-up company spun off from UC San Diego. 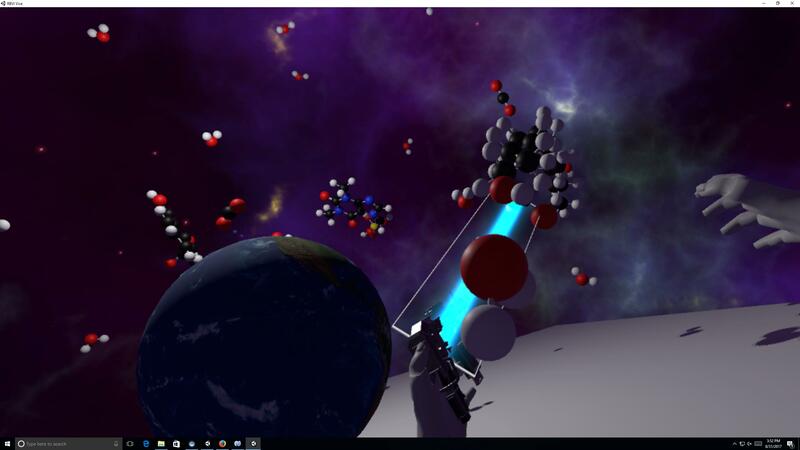 June 29, 2018: Nano Simbox iMD virtual reality interactive molecular dynamics developed by Interactive Scientific. 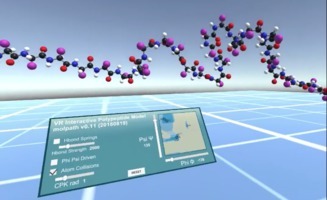 Sampling molecular conformations and dynamics in a multiuser virtual reality framework. 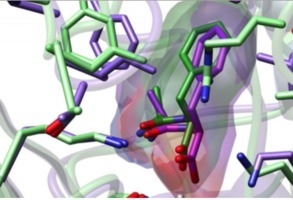 O'Connor M, Deeks HM, Dawn E, Metatla O, Roudaut A, Sutton M, Thomas LM, Glowacki BR, Sage R, Tew P, Wonnacott M, Bates P, Mulholland AJ, Glowacki DR.
June 28, 2018: ChimeraX VR article published describing drug binding site and light microscopy capabilities. 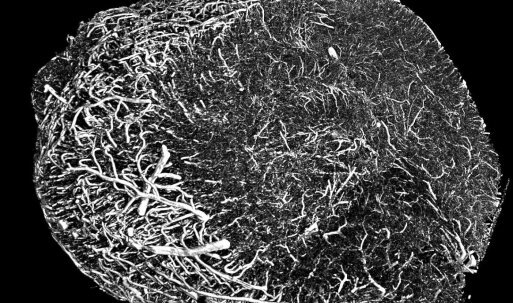 June 24, 2018: ConfocalVR article published describing 3D light microscopy visualization. 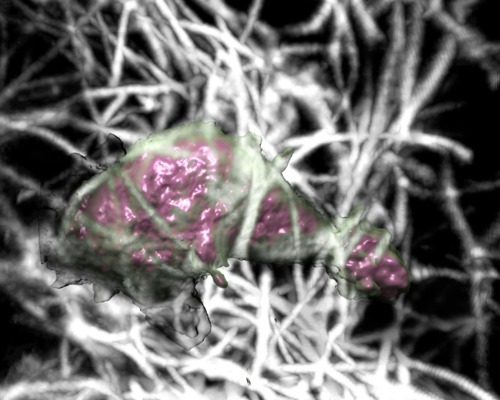 ConfocalVR: Immersive Visualization Applied to Confocal Microscopy. Stefani C, Lacy-Hulbert A, Skillman T.
J Mol Biol. 2018 Jun 24. pii: S0022-2836(18)30664-8. 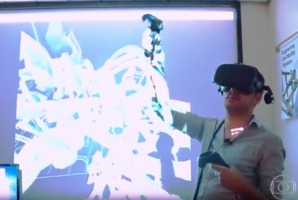 September 18, 2017: UCSF professors Derek Harmon and Kimberly Topp using VR to teach anatomy. Mechanism of post-translational methylation of a ribosome nucleotide causing antibiotic resistance. Shown in VR for Byer's award reception. 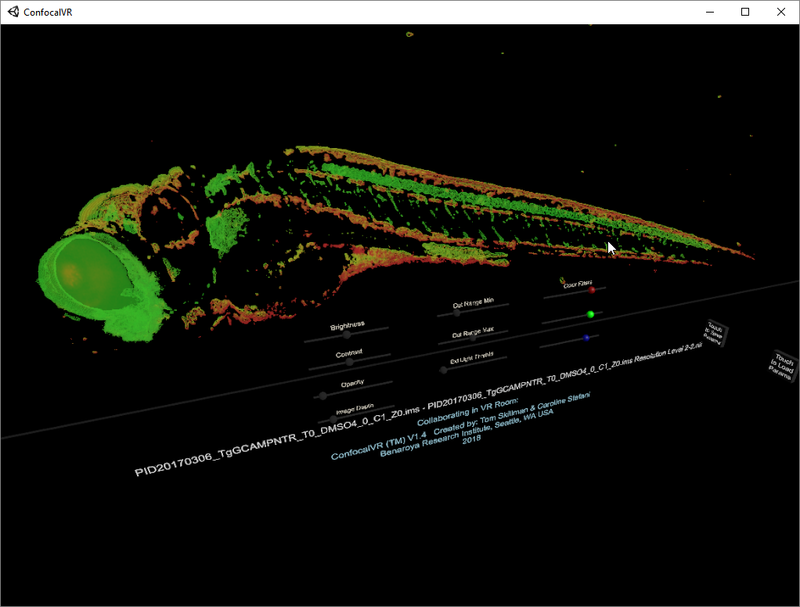 Neurodegeneration in zebrafish in 3d light microscopy time series from Jeremy Linsley at Glastone Institute shown with ConfocalVR. ChimeraX VR meeting command allows multiperson viewing of structures and microscopy data. ConfocalVR displays multichannel 3D light microscopy data. 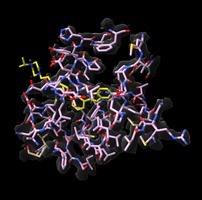 AltPDB collaborative viewing of Protein Databank molecular structures. Nanome allows display and analysis of molecular structures of proteins including multiperson collaborative sessions. syGlass displays volumetric and microscopy data, designed for VR. 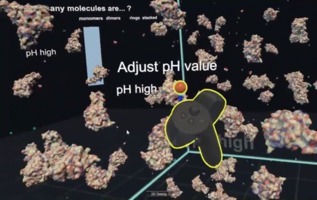 Molecular Zoo is a biomolecule education VR program that lets children handle fully flexible molecules of life: water, aspirin, saturated fat, carbon dioxide, caffeine, ATP. Fishtank is a STEM education application showing the pH dependent formation of protein dimers, rings and tubes of an antioxidant enzyme. Currently (Sept 2018) only Unity source code releases are available at Github, but a binary release for Windows is coming. Work in progress: interactive polypeptide backbone viewer for teaching using Unity and Oculus SDK. Currently (Sept 2018) only Unity source code releases are available at Github, but a binary release for Windows is coming. 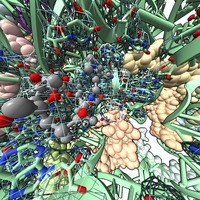 Nano Simbox iMD allows exploring flexible molecules with molecular dynamics computed in real-time on a server. It has four scenarios, handling Buckminster fullerene, threading methane through a carbon nanotube, changing the screw-sense of an organic helicene molecule, and tying a knot in a 17 amino acid peptide. 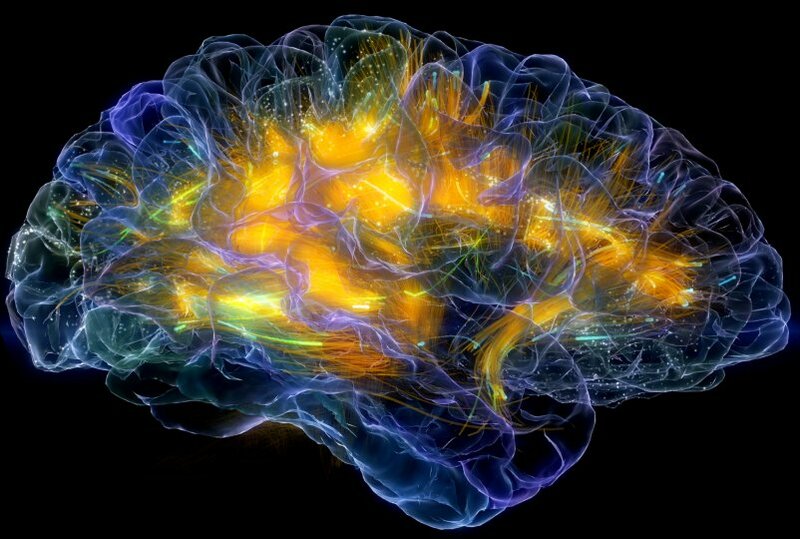 Developed by Interactive Scientific in collaboration with the Glowacki lab at University of Bristol, and described in this article. 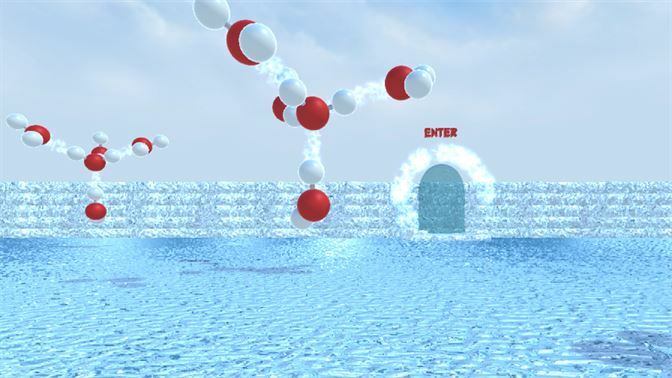 Water VR shows water in gas, liquid and solid phases for teaching chemisty, specifically aimed at 7th grade students. 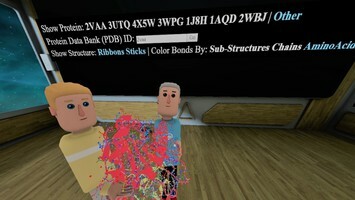 Developed by EduChemVR. An HTC Vive virtual reality headset for viewing your molecular structures or microscopy data is available at the Visualization Vault in Genentech Hall at UCSF Mission Bay. Contact Tom Goddard. We use Windows 10 Home on our VR computers. We use primarily SteamVR to interface to all headsets. Wikipedia headset comparison. Vive Pro ($1400, released April 2018) - Higher resolution (1440x1600 per eye) makes reading text easier. More expensive ($1400 with hand-controllers and version 2 base-stations). Samsung Odyssey ($400, released Nov 2017) - Most portable, using inside-out tracking instead of base stations. Higher resolution (1440x1600 per eye). Shorter cord to computer limits range of motion. Hand controllers have no recharge port. Needs bluetooth used by controllers. Works with Windows Mixed Reality runtime, or SteamVR runtime. HTC Vive ($500 + $100 for headstrap, released April 2016) - Best tracking system. Deluxe headstrap is easier to adjust, more comfortable, and provides audio. Resolution (1080 x 1200 per eye). Oculus Rift ($400, released March 2016) - Best hand controllers, not as bulky, extra button, better button placement. Tracking is a pain, best to have a 3rd camera sensor, uses lots of USB ports. Resolution (1080 x 1200 per eye). Oculus DK2 - Historical developer kit 2 headset, released July 2014. Positional tracking using a single camera, loses tracking when facing away from camera. Resolution 960 x 1080 per eye. Frame rate 60-75 Hz. Oculus DK1 - Historical developer kit 1 headset, released March 2013. Only rotational tracking. No external base stations. Oculus SDK required app GPU code to correct lens distortion and chromatic aberration. Resolution 640 x 800 per eye. Frame rate 60 Hz. Nvidia GTX 1080 - Main card we have used at UCSF. No problems observed. 8 Gbytes of memory. Nvidia Quadro P6000 - Primarily because of its high price, we recommend this card only for special applications. We use this for both LCD shutter glasses and VR. The Quadro cards provide a 3-pin DIN connector for the left/right eye synchronization with shutter glasses. The IR emitter used with shutter glasses is overpowered by Vive (version 1) base stations so shutter glasses cannot be used with Vive base stations plugged in. This card has 4 display port outputs and no HDMI output. The Samsung Odyssey VR headset would not start using an HDMI to DisplayPort adapter with the Windows Mixed Reality setup program giving an error (Sep 2018). 24 Gbytes of memory. This card was generuously provided by NVIDIA Corporation's GPU grant program. Virtual Reality in the San Francisco Public Libraries - pre-proposal to setup VR systems for informal STEM education in the 27 branches of the San Francisco public library. Full proposal due November 17, 2018. 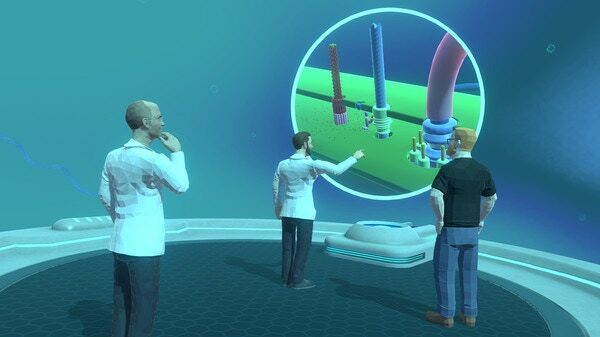 Analysis of Molecules and Cells in Virtual Reality - Setup research VR systems in 5 UCSF labs for cryoEM structure refinement, 3D light microscopy, and multi-person VR collaborations. Funded Aug 1, 2018 for 1 year. 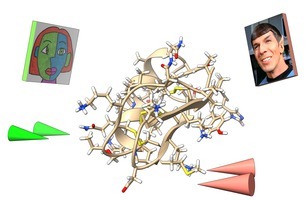 Exploring Drug Binding using Molecular Dynamics and Virtual Reality - proposal by Tom Goddard, Wilian Cortopassi Coelho, Matt Jacobson, Michael Grabe, Tristan Croll, and Tom Ferrin to study mutations effecting drug binding sites. Funded. January 2018. Virtual Reality Molecular Playground - proposal for STEM education VR application to familiarize students with biomolecules. Not funded. January 2017. Steven Abbott - Developer of many WebVR apps related to solvation. Marc Baaden (Institut de Biologie Physico-Chimique) - Developer of UnityMol library for representing molecules in the Unity3D game engine. Alan Brilliant (UCSC) - Developer of Molecular Zoo biomolecule education application. Wilian Cortopassi Coelho (UCSF) - Studies drug-receptor interactions using VR in Matt Jacobson's lab. Publishing 3 drug studies in July 2018 using VR analysis. David Doak (Norwich University of the Arts) - Developed peroxiredoxin fishtank STEM application and is working on a protein backbone explorer app. Shawn Douglas (UCSF) - Developed VR lab simulation for DNA origami research. Tom Ferrin (UCSF) - Provides shared HTC Vive VR equipment in the Visualization Vault. Christopher Fortney (NIH) - Manages the Virtual Reality Consulting Service at the NIH library. Tom Goddard (UCSF) - ChimeraX VR developer. Matt Jacobson (UCSF) - Analyzes drug binding, weekly use of VR in group meetings. Meghan McCarthy (NIH) - Using ChimeraX VR with radiologists at NIH. 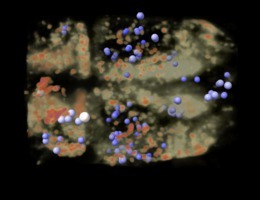 Dyche Mullins (UCSF) - VR visualization 3D light microscopy of crawling neutrophil cells. Tom Skillman (Immersive Science) - Founder of Immersive Science, developing VR science applications ConfocalVR for light microscopy, AltPDB for collaborative molecular structure viewing, and FCS-VR for flow cytometry analysis. Caroline Stefani (Benaroya Research Institute) - Developer of ConfocalVR for light microscopy, working with Tom Skillman. James Tyrwhitt-Drake - Developer of speech recognition command input from ChimeraX. Worked with Meghan McCarthy at NIH on virtual reality applications. June 23, 2018: Review of web applications in chemistry and structural biology. Towards Commodity, Web-Based Augmented Reality Applications for Research and Education in Chemistry and Structural Biology. April 30, 2018: Nature Toolbox VR survey. Virtual-reality applications give science a new dimension. Nature. 2018 May;557(7703):127-128. doi: 10.1038/d41586-018-04997-2. February 2018: Educational cell tour using EM segmentation. Journey to the centre of the cell: Virtual reality immersion into scientific data. Johnston APR, Rae J, Ariotti N, Bailey B, Lilja A, Webb R, Ferguson C, Maher S, Davis TP, Webb RI, McGhee J, Parton RG. Traffic. 2018 Feb;19(2):105-110. doi: 10.1111/tra.12538. Epub 2017 Nov 21.